Andrew Sullivan is newly convinced — but surprised and confused — that President Obama is permitting John Brennan to hold up the release of the Senate Torture Report. It is becoming clearer and clearer that one major power-broker in Washington is resisting the release of the Senate Intelligence Committee’s allegedly devastating report on the torture program run by the Bush-Cheney CIA. 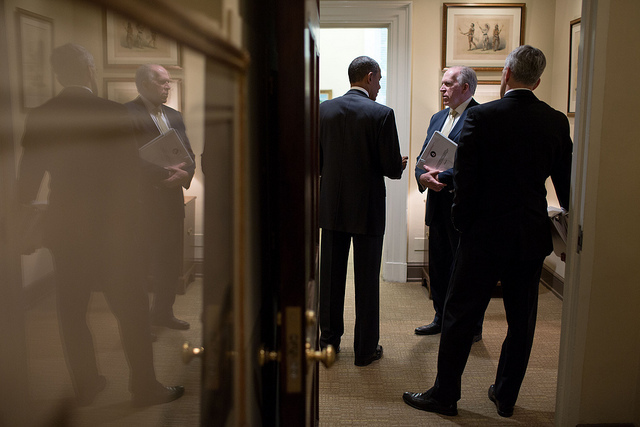 That major power-broker is the Obama administration. Brennan answers to the president, who has urged the release of the report. So why the hold-up? That is the question. Why is Obama allowing Brennan to undermine Obama’s own position? Why is the president allowing the CIA to prevent the very transparency he once pledged to uphold? I don’t know. But what I do know is that it is now Obama who is the main obstacle to releasing the Senate Report on Torture. Mind you, the evidence was pretty irrefutable back in May, too, and became more so in July. Moreover, I’m not sure Obama has “urged the release of the report” — though Joe Biden has. With specific reference to documents potentially subject to a claim of executive privilege, as noted in the question, a small percentage of the total number of documents produced was set aside for further review. The Agency has deferred to the White House and has not been substantively involved in subsequent discussions about the disposition of those documents. Indeed, I wonder whether the evidence in the Senate report showing CIA lied to the White House is not, in fact, cover for things some in the White House ordered CIA to do. This is, I imagine, how Presidential Findings are supposed to work: by implicating both parties in outright crimes, it builds mutual complicity. And Obama’s claimed opposition to torture doesn’t offer him an out, because within days of his inauguration, CIA was killing civilians in Presidentially authorized drone strikes that clearly violate international law. Again, I think this is the way Presidential Findings are supposed to work: to implicate the President deeply enough to ensure he’ll protect the CIA for the crimes he asks it to commit. But it’s not the way a democracy is supposed to work. Not a democracy, no. This is no better than those regimes, juntas, dictatorships and other tyrannies where power swaggers about naked. It’s not a “democracy”. Never has been. Ben Franklin supposedly said “A republic if you can keep it”. There is a world of difference. What I was always told was ‘a federal republic with representative democracy’. But if it’s a Senate report, the Senate can release it without deferring to the CIA’s supposed interest in response. And if it is a matter that the public definitely should know about, it is long past time for some whistleblower to leak it. Right, Senators? i have been wrestling with the perverse and very difficult-to-explain fact that government secrecy, for six decades in the u.s., has been so widely practiced and aggressively protected. i think the following quote from ew gets close to the core of what i am trying to understand, though coming from a different direction. “… by implicating both parties in outright crimes, it builds mutual complicity. And Obama’s claimed opposition to torture doesn’t offer him an out, because within days of his inauguration, CIA was killing civilians in Presidentially authorized drone strikes that clearly violate international law. or to put it less cutely and more directly, are an authorization to conduct government business in a brutal, amoral, illegal fashion completely at odds with long-established moral and legal traditions of our society, e.g., habeas corpus and torture, and tbe american constitution. do so out of the secret THRILL of being able to take such actions, e.g., todachev, with no serious legal or political consequences. assertions by would-be perps of the need for “gloves off memoranda”, renditions, torture, drone attacks, limitless electronic spying are simply the national security rational for u.s. government officials and agents behaving like vicious teen-age (or pre-teen) punks – 60 + years of “lord of the flies” by the likes of regan, cheney, tenent, gross, bush, obama, meese, ashcroft, gonzales, mucusy, holder. i understand that injecting guesses at motives (human psychology) into this discussion will elicit disdain, but i view that as some readers’ problem, not mine. Sullivan’s doe-eyed faith in Obama-as-daddy authoritarianism is getting embarrassing. @mspbwatch: What did you expect? Now that the witch(Thatcher) is dead he needs a new daddy/mommy figure. In the context of EW’s comments, what, EXACTLY, is this huge difference? And, how does being a republic somehow bring meaning to this so important distinction? @mspbwatch: It would be embarrassing if it were solely emitted from his psyche, but I believe it is his job to perennially breathe life into the corpse, to steer gullible but sincere gawkers away from what anyone with eyes can see: that the rulers of America and the West in general are corrupt torturers and imperialists, who use other people’s lives to prop up their wretched rule and gather the wealth they seize as their own. Docket Inflation at the FISA Court? Gronks and Donks Trash Talk Bonanza!